The term ‘communication of the absence’ concerns the problem of reconfiguration of the lost architectural volume. The issue regards the archaeological monuments that had mostly reached our days only at the foundations level. On the example of the archaeological area ‘La Cuma’ of Monte Rinaldo the development of the on-site communication project based on a certain methodology is showed. It provides the complex analysis of the monument, the research of study cases, the definition of project vision and the choice of the most effective solutions aimed at giving back a disappeared image of the ancient complex. 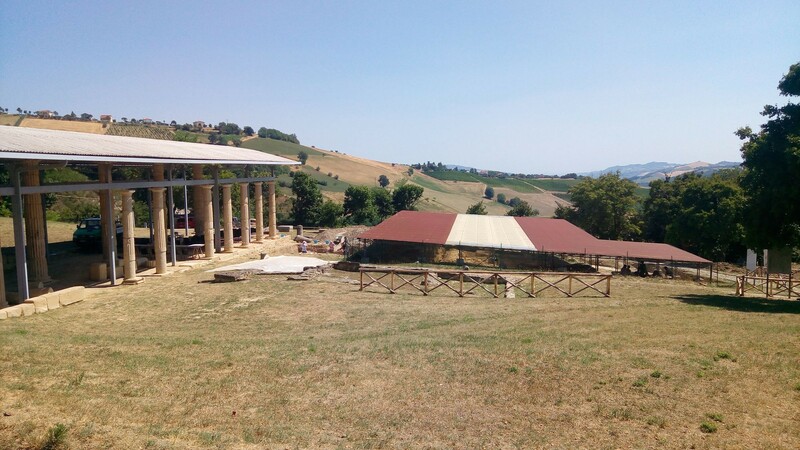 The archaeological area «La Cuma» is situated in the town of the same name in the district of Monte Rinaldo, province of Fermo, on the northern edge of the Valley of Aso, on a steep hilly slope, and it contains the ruins of a Roman sanctuary of the late Republican period. The complex represents one of the cases that perfectly shows the problematic nature of the cultural communication inside an archaeological site. The challenge rises from the characteristic that discerns a museum from an archaeological area: the narrative protagonists of the latter are the non-visible or partially visible objects, the structures that have survived for the most part only in their foundations. Here lies the problem of the transformation of the «ruins into understandable signs» (Manacorda 2011, 111) and consequently the theme of the «communication of the absence». It is about the research of the most efficient tools for «physically evoking the immaterial elements, the barely distinguishable traces, the ephemeral signs that only to the expert sight of an archaeologist can become perceivable elements with clear and immediate effect» (Bolzani 2014, 148). 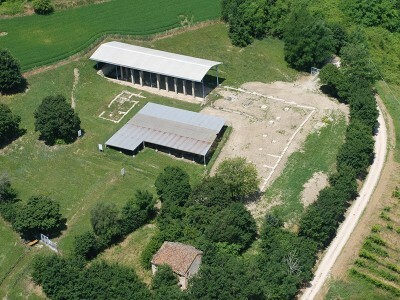 Therefore, the aim of the actual project consists in the identification of the solutions to attain the recreation of the lost image of a majestic Roman sanctuary of Monte Rinaldo that favours, as comprehensively as possible, the reconfiguration of the lost sacred place as well as an increase in the exposure and fruition of the site. The definition of the vision of the communication project and the subsequent adoption of the strategies deemed most effective in enhancing the site «La Cuma». The history of the sanctuary of Monte Rinaldo is closely linked to the presence of Rome in the territory of Piceno, starting from the Republican period. At the moment, the dispute about the commission of the monument has not been completely resolved (Bernetti 2009; Menchelli, Iacopini 2016), but there is no doubt about its dominant role exercised over the surrounding administrative territory, maybe with the attribution of functions not only of a religious nature but also administrative, due to the high positioning of the monument, overlooking the valley, creating a strong scenographic effect. Beginning of the 1st century B.C. – 1st century A.D.: decline and consecutive abandonment. Currently inside the site, which extends over an overall surface bigger than 10,200 sq.m, the ruins of the three main structures of the ancient sanctuary are visible: the temple, the surrounding colonnade (particularly the northern stoà and the eastern branch) and the building denominated in the research material as «C», presumably destined to ritual procedures (fig. 1). 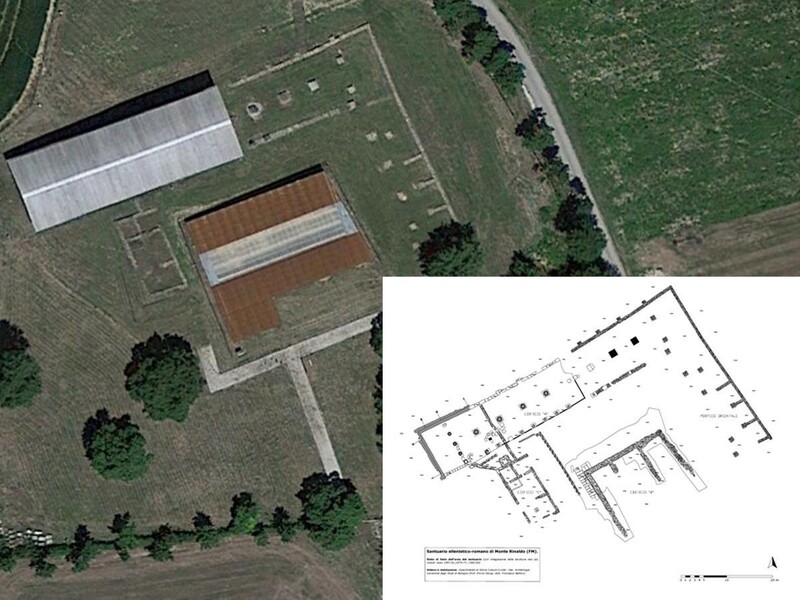 Some problems regarding the current appearance of the archaeological area «La Cuma» originate from both the ancient events and the modern interventions, complicating the enhancement of the material ruins located inside the site. During ancient times, the natural processes (such as earthquakes, floods) and the anthropic developments (for example, reconstruction works) had already altered the appearance of the sacred complex, transforming the landscape, erasing the attendance levels of the sanctuary and the proof of the architectural phases of its structures. The excavation and renovation activities, begun in the 1950s, led to the permanent dismantling of some architectural layers and to the refounding, and partly to the complete rebuilding, of the facades left standing. As a result, the current planimetry of the architectural complex is linked to the phase dated between the end of the 2nd century B.C. and the beginning of the 1st century B.C., without the most ancient traces and the alterations of the following centuries. The irretrievable loss of information makes it difficult to piece together the evolution of the sanctuary, since tangible records, upon which a narrative could be built, are lacking. Moreover, the current visible structures have different conservation statuses and readability levels. Not only the correlation and the hierarchy between the buildings are vague, but so are the joints of every single structure. So, for example, the western sector of the northern colonnade, subject to the partial anastylosis of the 1960s and 1970s (fig. 2), ends up being more comprehensible and «attractive» for the average visitor compared to the eastern part of the same building, which has undergone a simple restoration, and to the other structures present in the site. Among the negative effects of modern interventions are, among other things, the installation of the canopy of the temple and the covering of the northern stoà. Both structures provoke a strong visual impact (fig. 3). However, while the canopy placed upon the remains of the temple has a temporary nature linked to the continuation of the excavation of the site, the covering of the colonnade is presented as a permanent work, with unjustified protective and reconstructive functions. The double pitched structure causes water drainage inside the monument, contributing to its alteration. Moreover, it mimics the erroneous interpretation of the original stoà that, in all likelihood, had one slope, leaning forward towards the inner sacred area. Lastly, the covering under consideration seems bulky, appearing in evident disharmony with both the monument for which it was designed and the surrounding landscape. Other identified problems concern the set-up solutions adopted inside the archaeological area at hand. Thus the chosen itinerary signals, such as the gravel pavement sections and the wooden railings (fig. 4), even though they do not have an invasive visual impact, end up being ineffective since they only partially delineate the progression of the visit. Lastly, almost all the information panels located in the archaeological site are focused on the beginning of the itinerary path and they are distant from the archaeological traces they are referring to. This creates a situation where, at the beginning of the visit, the visitor receives all the information at once and he or she will unlikely associate them with what will be seen later, during the itinerary. Some panels are obsolete in light of new studies; others instead are misleading since they are linked to findings located at the county museum and not on the site. As a result, the communication plan is independent from the assigned context; a reference to the highlights of the archeological area, the remains of the structures of the sacred complex, has been overlooked. The vision of the current project focuses on the concept of «the restitution of meaning» to the visible remains and their contextualization into the historical landscape, in relation to the fields of conservation/protection and of the fruition of the site (Linee guida per la costituzione e la valorizzazione dei parchi archeologici 2012). Non-invasiveness: the communication within the site must take place with maximum respect for the surviving architectural structures (Vaudetti 2013, 57). Therefore, the chosen communication tools should be as noninvasive as possible. In light of this, the reconstruction of the buildings ad identicum (applied to the archaeological areas of Terramara di Montale and Monte Bibele) would probably be the most effective solution to bring back the lost volume, but it would not match the preservative necessities of the site. Unity and readability: it is considered essential to convey the site through an itinerary path able to integrate its components into a sole project, establishing the relationships between the structures, as well as between the archaeological emergencies as a whole and the landscape (Bolzani 2004). Moreover, the set-up to be implemented shall be provided with choices that focus on the architectural remains and that contribute to their visibility. So the implementation of bulky structures is not recommended, unless they are needed for a conservation and protection purpose (such as the covering of Villa del Casale that reproduces the possible volume of the complex), since they may divert the attention of the visitor and create an interference in the perception of the general framework, obstructing the storytelling. 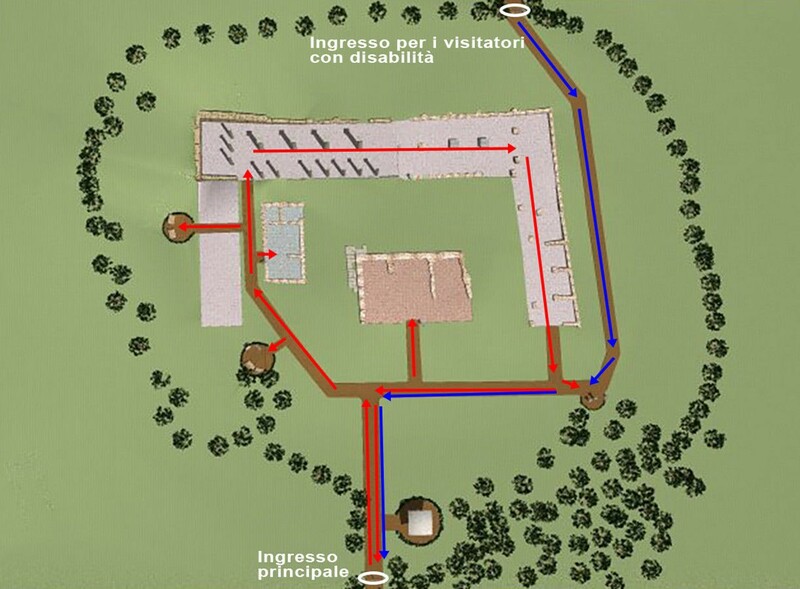 Accessibility and mobility: the visitors’ needs must be taken into account, not only in terms of the quality of the site’s perception, but also in regards to their physical well-being (Vaudetti 2013, 57), which must be guaranteed by the equal accessibility to the archaeological site and by the appropriate organization of the itinerary path, with provided staging points. Multilevel communication: the organization of the communication, divided into various levels coordinating and complimenting among themselves, allows, as completely as possible, for the information acquired through the scientific exploration of the area to be transmitted, giving additional sense to the peculiarity of the visible elevations (Genovesi 1999, 105; Da Milano, Sciacchitano 2015, 41; Ghedini 2014, 199). Attractiveness and comprehensibility: «an image is a powerful means of transmission of the cultural message» (Vitale 2010, 99) since first it captures the attention of the visitor and ensures the immediate perception of the content. However, the making of a comprehensible archaeological site not only includes the proposal of a reproduction of the lost architectures, but also the possibility to associate it directly with the original preserved evidence and the current landscape, contributing to the contextualization of the monument into the territory of relevance (some examples could be VR and AR technologies, in addition to the particular case of overlapping of a graphic reproduction to real structures, such as the perspective slabs of the Ancient Port of Classe). Scientific methodology and aesthetics: these criteria concern the final result of a possible reconstruction of the archaeological complex. Following the essential philosophical principle, the limits of the development of the reconstructive hypothesis must be established to obtain the most accurate image (Antinucci 2004, 112); at the same time, it must not be overlooked that the final result is addressed to the non-expert visitors and so it must have an aesthetically pleasing appearance, as well as being credible. Effectiveness and efficiency: the adoption of the most advanced and original communication solutions may encourage the interest on the part of the visitors towards the monument; however in the case of the site «La Cuma», characterized by a very small surface, due to its significant distance from the active tourist routes and the relatively small quantity of visitors, the use of certain tools may be inopportune, both in terms of function/utility (compared to the archaeological areas of Iuvanum, Rosselle and Marzabotto, where the application of multimedia technologies is more justified due to the considerable dimensions and difficult articulations of the sites) and of economy, meaning the costs of realization and consecutive maintenance (as happened with the noteworthy reconstruction of the metal wires of the basilica of Santa Maria di Siponto). Based on the previously written guidelines, the following strategies are considered the most efficient to be applied to the site of Monte Rinaldo: the removal of the current coverings; the highlighting of the foundation areas; the rearrangement of the itinerary path with the addition of the chosen viewing points, providing the integration of both verbal and non-verbal communication tools. As already mentioned, the canopy placed upon the remains of the temple has a temporary nature and it will be taken apart once the excavation works end. In regards to the covering of the northern colonnade, its presence is not justified from the preservative or from the communicative point of view. The removal of the structure does not undermine the conservation status of the monument, in the absence of highly sensitive artifacts, and the stability and protection of the area of reference can be granted by direct actions of consolidation of the stone slate. Moreover, with the suggested operation the erroneous interpretation of the original roof of the colonnade, confusing the visitors and providing wrong information, will be eliminated. Lastly, the dismantling of the coverings located in the archaeological area of Monte Rinaldo will increase the visibility of the ancient structures and will strengthen their interaction with the surrounding landscape (fig. 5). For every emerging structure present on site, the realization of different coloured flooring is recommended, with gravel or local stone, placed on layers of non-woven sheets which will prevent the growth of grass (fig. 6). This solution visually splits the planimetry of the constructions on site, as well as highlighting them compared to the surrounding terrain, facilitating the readability and increasing the comprehensibility of the articulation of the sacred complex. The illustrated solution could also be applied to highlight the possible boundaries of the western branch of the colonnade. Despite the absence of visible remains of the building, this solution will enable us to immediately communicate to the visitor the hypothetical planimetry of the stoà, introduced through other reconfiguration tools of the lost image. It is considered appropriate to maintain the current entrances to the archaeological area, in order to guarantee an equal accessibility. The realization of a circular itinerary with integrated blocks has been proposed, where every block is represented by a surviving construction, which may be directly accessed. Both the beginning and end of the visit are linked to the main entrance in which the system of signs will point to the entrance for differently abled visitors (fig. 7). In order to facilitate the itinerary for all kinds of visitors, with an increased attention to the passage of wheelchairs and strollers, it is necessary to create flat levels of a minimum width of 2.5 m.
These itinerary sections can be made through the use of pitched wooden flooring. Such a solution is effective due to its flexibility, as it permits resorting to alterations without a direct intervention on the ground, and for the reflection and chromatic features, which exclude the appearance of visual annoyances. The itinerary suggested for the site «La Cuma» features two rest areas, situated on the western border of the complex, where the panorama of the site and the surrounding landscape can be admired, as well as special viewing and information points. In order to reach the biggest comprehensibility of the archaeological traces of the site of Monte Rinaldo, it is suggested to integrate two solutions of visual reconstruction. The first one is more conventional and linked to the creation, at the beginning of the itinerary path, of a shielded introduction area, where a model of the Roman sanctuary will be placed, scaled down to 1:50, for example, made of cortén or another sturdy material (fig. 8). The efficacy of the scale model for the restitution of the appearance of the lost volume does not raise doubts, since it is a tool which shows the entire object of the narrative, immediately communicating to the visitor what is going to be explored (Capitani Guerra 2012; Di Nicolò 2012). The other solution represents a revisitation to the concept of the prospective slabs of the Ancient Port of Classe. More specifically, the placement inside the site of Monte Rinaldo of three special viewing points is planned, in the introduction area and in the south-eastern and south-western corners of the complex, with the installation in each area of two fixed observational binoculars of 1.50 and 1.20 m in height. Starting from the principle of the integration of the physical space with the graphic reproductions, the images of the graphic reconstruction of the sanctuary in its most prosperous period (dating back to the second half of the 2nd century- the beginning of the 1st century B.C.) will be applied to the binocular lenses (not increasing magnification) which will overlap with the current landscape (fig. 9). Compared to the scaled model, this solution, maintaining a non-invasive nature, allows visitors to associate the reconfigured image directly to the visible architectural remains, restoring their meaning and bringing back the monument to its context. Moreover, this will solve the problem for the visitor of finding the right overlapping spot, which is immediately offered with the described technique. The variation of the solutions of the visual reconstruction, with the help of textual communication tools, is planned as part of the project. More specifically, in the critical stages of the itinerary, the placement of lectern information panels is proposed, of a maximum height of 1.20 m, which will not hinder the user’s fruition during the visit (fig. 19). The readability of the information panels must ensure compliance with the technical requirements such as the proper choice of background colours, the size and colour of the typographic character, the length of the lines and of the line-spacing (Vitale 2010, 198-200), as well as the use of a plain and concise language, without resorting to long sentences and specialized terminologies (Pascucci 2007, 57). The contents of the didactic supports placed in the archaeological site «La Cuma» must be established in the context of the specific scientific project but, in any case, they must convey not only the general rudiments, but also the specific in-depth analysis. Waiting for the realization of the «communication of the absence» project, suggested for the archaeological area «La Cuma», it is worth mentioning certain benefits, achievable at least on a theoretical level. First of all, the importance of the adoption of the methodology, stated in the introductory part, should be stressed, even if it was not developed in detail in this article, but it is vital to the execution of a work such as this one. 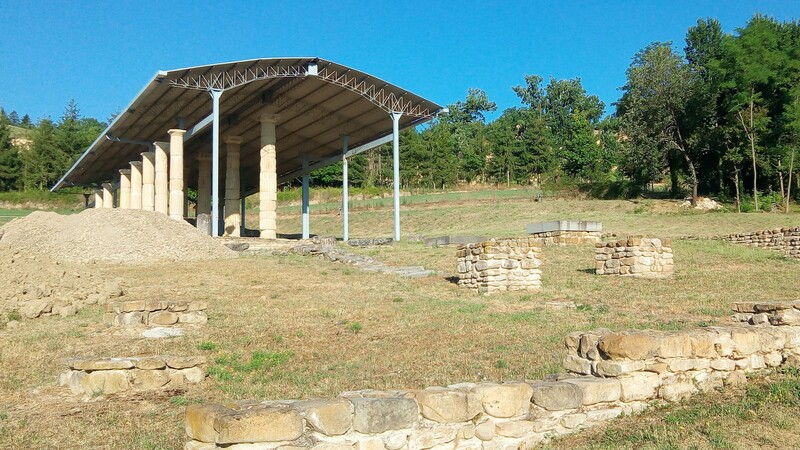 It allows us, in fact, to enter the archaeological site with full knowledge, to recognize the sequence of events which had an impact on the current appearance of the monument and to identify its main features and the problems linked to its enhancement before continuing on to the proper elaboration of the project. The analysis of the adopted communication solutions on various archaeological areas, in turn, allows us to see the pros and cons of the possible reintegration tools of the lost image. Even the formulating of the vision of a communication project turns out to be an essential phase, since it allows us to identify the criteria which determines the choice of the adopted strategies inside a site of interest. Therefore, the philosophy of the proposal drawn up for the archaeological site of Monte Rinaldo focuses on preservation and fruition concepts; it can be said that the suggested interventions, in the context of the actual project, completely correspond both to the elaborated vision and the current enhancement necessities of the former Roman sanctuary. Indeed, the adopted solutions guarantee the facilitation of the planimetric readability of the surviving structures, the restitution of their historical importance, the immediate perception of the lost volume, contributing thus to the visibility and fruition of the site «La Cuma». Vaudetti, M. 2013. «Per un approccio metodologico all’allestimento dei siti archeologici.» In Mostrare l’archeologia. Per un manuale-atlante degli interventi di valorizzazione, edited by M. Vaudetti, V. Minucciani, and S. Canepa, 52-60. Torino: Umberto Allemandi &C.
Irina Ivanova 2018, ‘Communication of the absence: possible instruments. 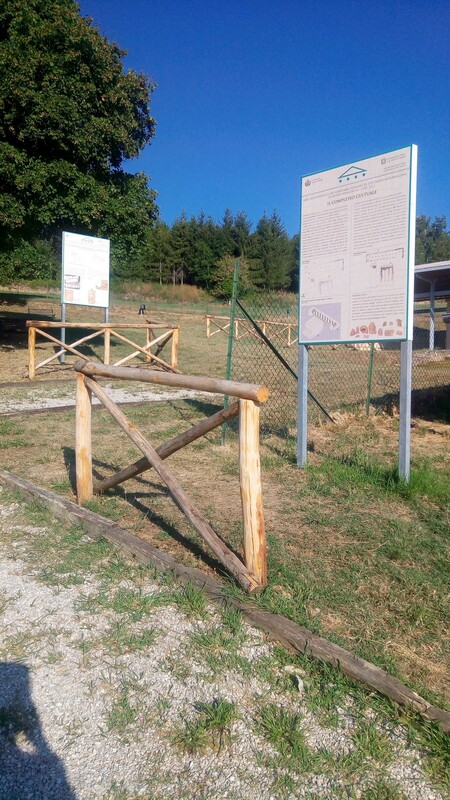 On-site communication project for the archaeological area ‘La Cuma’ of Monte Rinaldo’, in Groma 3. doi: 10.12977/groma16.